Honestly, he’s rated higher as a pure wicketkeeper than the current Jos Buttler. The omission of number three Gary Ballance from England’s Test side is a big opportunity for Bairstow to impress, and remains the only change for the English following their thumping 405-run loss to Australia at Lord’s. England selector James Whitaker stated, “Jonny has worked extremely hard at his game and his record for Yorkshire speaks for itself. He fully deserves this opportunity”. “We feel that [Ballance] will benefit from some time in county cricket to rediscover his form. He has already had plenty of success at international level and as selectors we are confident Gary will play a significant role for England in the future”, Whitaker added. Bairstow has been presented with an excellent chance to prove himself as a regular in the English batting order (likely at number five), in what has been a top-six carried by Alastair Cook and Joe Root so far during the 2015 Ashes series. He initially came across as a batsman that was perhaps better suited to limited overs cricket, with an ability to score runs quickly through big strokes. However, he has noticeably struggled to grind out a patient Test match innings, resulting in a low Test match average of 26.95 from his 14 appearances. Bairstow last played a Test in the fifth match of the 2013-14 Ashes series, in Sydney, where England were comprehensively beaten by 281 runs in what was a 5-0 series sweep for Australia. More recently, he has gone away and done the best thing he possibly could have – piled on the runs at County level for Yorkshire. 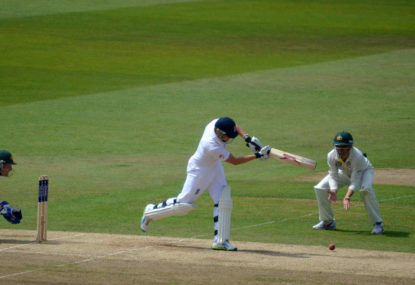 In his last handful of county matches, Bairstow has produced a knock of 93, a century, and an enormous double-hundred. Jonny Bairstow is just 25, and with only 14 Tests to his name there is the potential for so much more. Can he take advantage of England’s current middle-order struggles and nail down a place in the order?